Time for those that celebrate Easter to boil the eggs, break out the dyes and baskets and plan Easter dinner!! This year I am off the hook for hosting – something that I am kind of happy about, however I will be bringing a number of dishes for Easter dinner. One of them happens to be these biscuits. 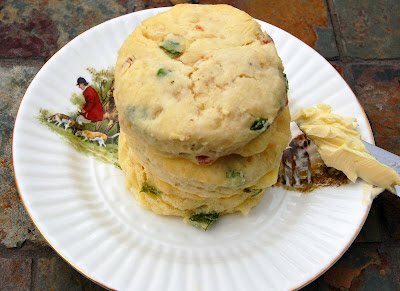 They are a take off of my Goat Cheese Scones that I have been making a long time and am just crazy for. In my last post, I shared with you my adventure to NYC and the Kerrygold event I attended. What I didn’t say was that those wonderful folks from Kerrygold sent us each home with a roller bag full of cheeses and butter! That’s right a roller bag people! That was some serious Irish Love and made me such a happy, happy girl! As my mom and I spent the rest of the day and evening in NYC, a number of folks were eyeing up that bag as I rolled it into places we shopped at, a bar or two and the place we had dinner – I think they thought I was selling something – lol! So, with a nice stock of beautiful Irish cheese and butter to enjoy I set out to come up with a biscuit for Easter. I think I added in the bacon because of the Friday’s during Lent that I cooked up some for my son as I longingly stared at it, smelled it and wished for a bite…or two or three! This was my chance to get some of the bacon I missed out on lol! Okay…yes I did eat like…4 of them…right in a row, I couldn’t help myself. Who can resist just out of the oven biscuits, smeared with butter – not this lass! Kerrygold also sent me a few recipes you may enjoy for your holiday table or any table filled with your loved ones on any given day! Take a look! For more fantastic recipes from Kerrygold, visit their Facebook page or website! Mix together the Kerrygold butter, capers, anchovies, parsley, rosemary, thyme and garlic. Season with salt and pepper. Open out the boned leg of lamb on a work surface, fat side down. Spread the butter mixture over the meat, then lay the halved leeks to run along the middle of the lamb. Roll the lamb back up and tie with string, or use butcher’s elastic bands (ask for a few when you buy the meat). 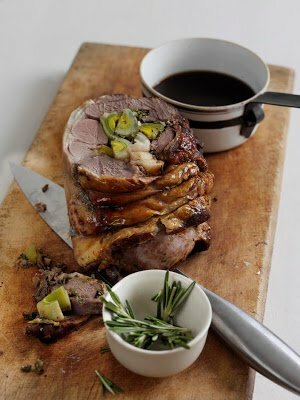 Place the lamb in a roasting tin and roast for 1 ½ hours or until cooked to your liking, basting from time to time. Remove the lamb from the oven and cover with a sheet of foil. Leave to rest for at least 30 minutes before carving. Top tip: Why not try cooking this recipe with Kerrygold Lighter Unsalted butter and save 2.4g fat/20 calories per portion. This recipe was made using Kerrygold block butter. Now you all know how much I love cooking with and for kids…this is a fun project to cook up as part of your Easter festivities with yours! In a mixing bowl, beat the butter with a wooden spoon until smooth and creamy. Add the sugar and beat for 2-3 minutes until light and fluffy add in the vanilla. Sift in the flour, stirring to combine. Add the egg yolk and bring the mixture together with your hands, kneading lightly until smooth. Wrap and chill for 15-20 minutes. Line 2 baking sheets with baking parchment paper. Roll out the dough on a lightly floured surface. 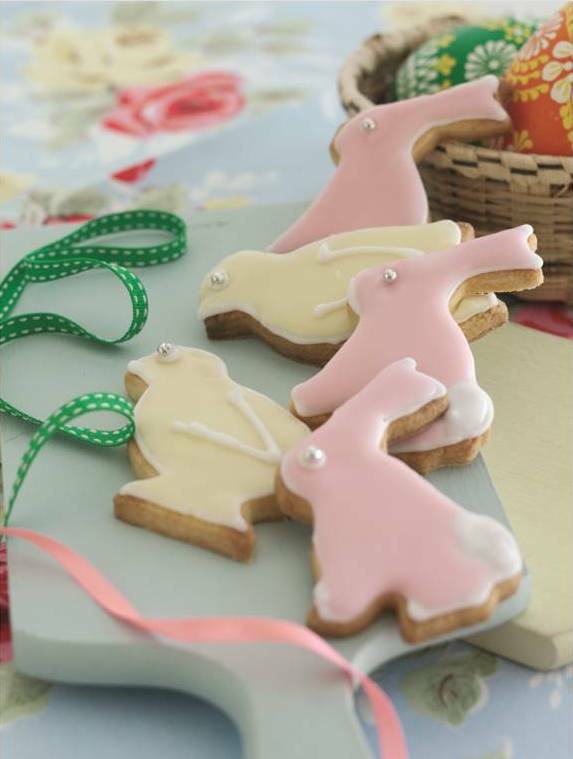 Use Easter bunny or chick-shaped cutters to stamp into biscuits (or use a plain or fluted cutter). Carefully lift onto the baking sheets. To decorate, mix the powdered sugar with a little cold water to make a thick icing. Use about ¼ of this to pipe thin outlines around the biscuits, and to pipe the bunnies’ tails. Leave to set. Share the remaining white icing between 2 bowls. Add 1-2 drops of red colouring to one bowl, and 1-2 drops of yellow to the other. Add a few more drops of water to thin the icing, then spread the pink icing into the bunny shapes and the yellow into the chicks. Leave until set, then pipe details with the remaining white icing. Store in a tin in a cool, dark place. Top tip: Why not try cooking this recipe with Kerrygold Lighter Unsalted butter and save 1.2g fat/10 calories per biscuit. Mix gently until it becomes doughy. Use a piece of parchment or wax paper as your work surface, scatter some flour and begin either shaping into biscuits or traditional scone wedges. Bake on a parchment lined baking sheet for about 20-25 minutes or until golden. Don’t forget to induldge yourself with some glorious butter smeared over top before you take a bite! Irish butter if you have it of course…heavenly!